Where Are Your Dental Crowns Made? Home > Dental Damage > Where Are Your Dental Crowns Made? Dental crowns are something many of us will need at some point in our lives. But while it may seem to be a routine dental surgery, failing to research your dentist and where those crowns are made could end up causing you damage later down the road. According to dental experts, dental crowns can have levels of lead that are not only unacceptable, but also downright dangerous. 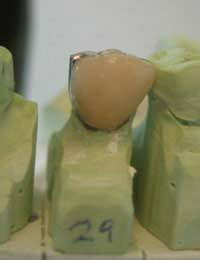 Recent testing has shown that some dentists in Britain and North America have used dental crowns that are sourced from China. While lead poisoning has only been documented in the United States thus far, it is feared that it's only a matter of time before a case occurs in Britain, given that we are using crowns and related dental products sourced from China. Some of these dental crowns and dentures are placing a dangerous level of risk on patients who receive the pieces. While the prices are lower and save money for the dentists who use them, the patients who receive them are typically unaware of these risks. A key problem is that these dental products are sourced from unregulated laboratories. Typically, these laboratories are overseas ones in places such as China. A recent investigation in the United States found four instances of lead poisoning. All of these were connected to dental products that had been sourced from China. So just how extreme are these cases? In one laboratory investigation, it was found that a dental product had more than two hundred times the legal level of lead. For trusting consumers, this is definitely a cause for concern. Experts in the field are warning that more and more dentists are taking on the practice of importing cheaper products, some of which can have these dangerous levels of lead. It's not to say that the dentists are maliciously choosing products with high levels of lead. Many dentists simply think they are saving money and don't realise that these products are outside of the acceptable limits. However, they are still responsible and the onus is on the dentists to ensure their dental products are safe for patients. In terms of the NHS, it's thought that cost-saving practices in the future will mean that more products are sourced from overseas outlets. Not all products from overseas are dangerous by any means – in fact, most will be safe. But the unregulated aspect of many of these laboratories is the main worry here. Experts are suggesting that we need to play a bigger role in ensuring these laboratories are regulated and monitored to keep dental products safe for patients. With approximately five percent of dental products being from China, we owe it to patients to make sure these are safe and within the acceptable guidelines. The way it works in Britain is that a British dentist can quite simply and easily cast an impression of the tooth or teeth requiring a crown. Then, this is posted to a laboratory in China, before the crown is sent to the dentist within a matter of days. Prices tend to be as little as one-tenth those of a crown in a British laboratory and a further half of that for the NHS. While British laboratories are stringently regulated and monitored, those overseas aren't always the same case. A laboratory in Britain is subject to random, unannounced inspections whereas those overseas may receive little or no monitoring. While patients do place trust in the hands of their dentist, for now it's wise to inquire about where your crowns and related dental products are made. Until this issue is fully resolved and transparent, the unfortunate result is that patients will have to take personal health into their own hands.